Today was one of my favourite teaching sessions as part of the Digital Resources in the Humanities class. The class assignment is to compare and contrast the digital version of a digitised object with its original: what is lost, what is gained, and how the experiences in accessing the “object” differ. So today’s class visit was a behind the scenes tour of the Petrie Museum of Egyptian Archaeology (one of London’s Hidden Gems, apparently). Students were set a few objects on the website, that they have to locate in the museum, and compare and contrast the different experiences they had of viewing the virtual object to visiting the original. What fun – followed by a discussion of aspects that came up over their hour’s visit, and looking in detail at the digitisation program the Petrie carried out (80,000 objects over a very short period of time indeed. We calculated in class that gave an image capture time of around 2 minutes per object). I feel really lucky to be at UCL and to have such a great museum on the doorstep – and thanks go to the conservator, Susi Pancaldo, for giving us a behind the scenes tour. 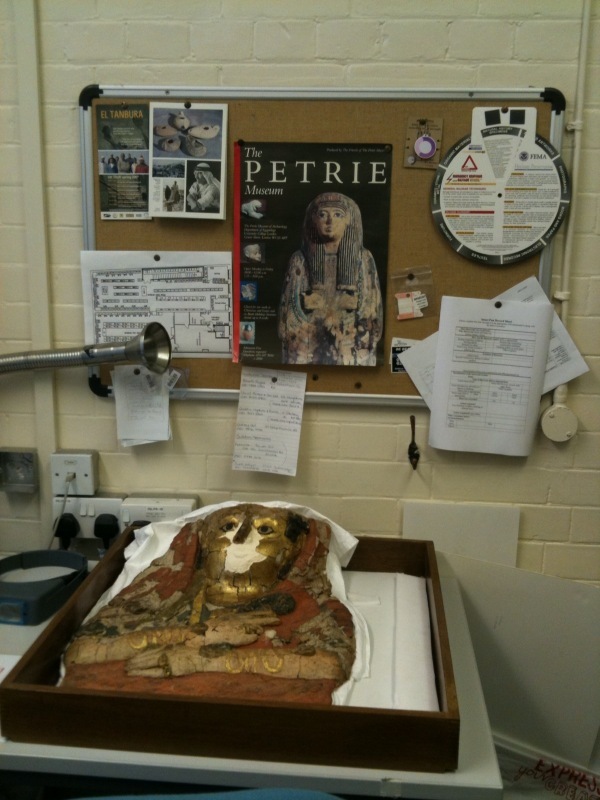 The snapshot above shows a pic of a mummy that is awaiting conservation. < Previous Farewell Vera – we’ll meet again?